(AINA) -- The Antiochian Orthodox church of Sts. Sergius and Bacchus was a landmark of al-Thawrah (also known as al-Tabqah). It was an impressive, modern structure with a large yard, surrounded by a high wall and well-situated on a main street near the corniche -- a well landscaped area hugging the southern bank of Lake Assad which was popular with locals going on an evening stroll. Its elegant dome, surmounted by a cross, could be seen from all parts of the Third Quarter (also known as Hayy al-Ishtirakiyah), where it was located. Spiritually, this church was under the jurisdiction of the archdiocese of Aleppo, the metropolitan of which, Boulos al-Yazigi, was kidnapped (and allegedly murdered) on April 22 of this year, along with the Syriac Orthodox metropolitan of the same city, Mor Gregorios Youhanna Ibrahim. It was built between 1985 and 1994, on land offered by the al-Thawrah's city council, and could accommodate up to 300 worshippers. 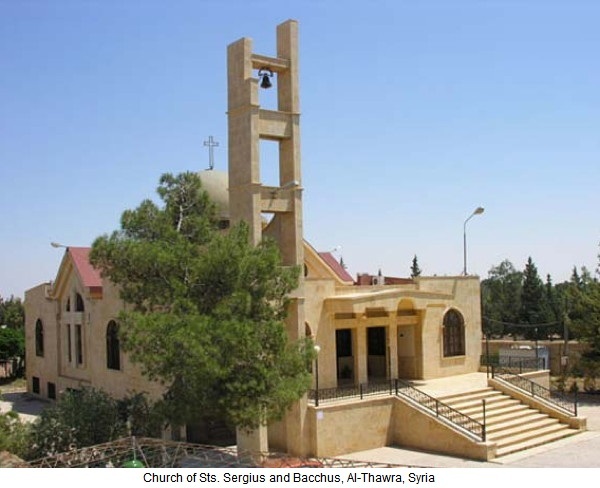 Moreover, not only did this church serve more than 250 Orthodox families, but it was also used by local Christian denominations which did not have their own places of worship, including the small Syriac Orthodox congregation. This was also one of only two Christian places of worship in the town, the other being the small church of St. George, which belonged to the Assyrian Church of the East. Built around 1973, along with a community hall, this was located in the older part of al-Thawrah, known locally as al-Qaryah (the village). Around 2000, a plot of land in the Third Quarter was purchased by this community in order to build a new church, closer to the three quarters that housed those working in the Euphrates dam -- and where the bulk of the Assyrians lived. Due to lack of funding, however, this project never materialised and, perhaps, for the better. On February 11, rebel fighters from the Islamist Jihadist "al-Nusra Front" -- designated by the USA, UN, Australia and UK as a terrorist organisation -- took control of the city and its strategic hydroelectric dam, the largest of its kind in the country. They also seized control of the three quarters that housed dam workers and in which, of course, stood the Orthodox Church of Sts. Sergius and Bacchus, and in which most of the Christians were settled. Christian eyewitnesses who fled al-Thawrah, now displaced in other parts of Syria, as well as in Lebanon and Turkey, tell of religious discrimination by the rebels, as well as forced confiscation of Christian possessions and properties, with many items being sold on the black market in order to purchase weapons and ammunition. Even the churches weren't spared. "The 'Free Syrian Army' demolished the [Sts. 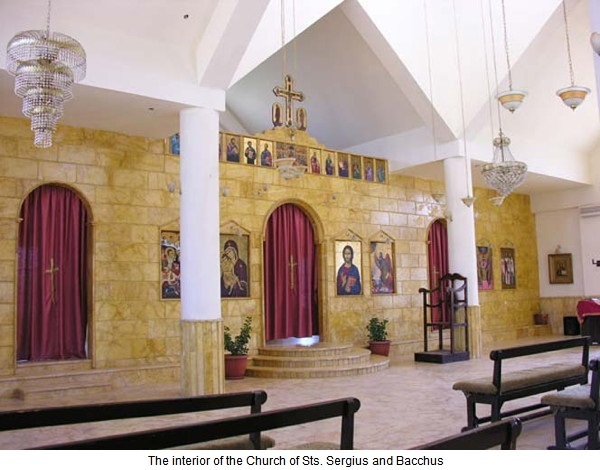 Sergius and Bacchus] church," lamented one refugee, "They tore up the sanctuary curtains, Bibles and other holy books, and broke all the crosses, chairs and icons of Jesus and the saints. They stole electrical appliances like fans, chandeliers and lights. They took whatever was in the church, and sold it all. There is nothing there now." There is no hope, however, for the Christians to return and rebuild after the conflict subsides -- that's if it indeed subsides. They were once considered better off than their relatives and friends who still lived in the villages they had migrated from, but are now destitute, having lost everything -- their homes, businesses, and even personal belongings. "Even though I have left," recounted another Assyrian refugee, "the terrorists still call and text me from there, on my cell phone, to bother me. They recently called and told me: 'If you attempt to return to al-Tabqah we will cut off your head and display it on the mosque so that all the Muslims there can see it and be proud of it.' They say other things too, but what they say is so disturbing, that I keep my phone switched off unless I really need to use it." Whilst it may be easy to switch off a cell phone, and ignore such threats, it is not so easy to shake off the trauma of dispossession and loss. After spending up to 45 years in a town which became their home, many of these refugees managed to escape with nothing but the clothes on their backs. "We have lost everything," said the head of an Assyrian household displaced from al-Thawrah, "There is nothing for us over there now, nothing to return to. We just need help to get out of here and settle in a country that's safe."